This explains the difference between each uniform, as different numbers and letters mean the rig is different. 1A – Full Ceremonial Dress. 3A – General Duty Rig. Jumper may be worn. 4A – Sleeves rolled down and buttoned. Tunic tucked in. 4B – Sleeves rolled up past elbow. Tunic untucked. 4C – Sleeves rolled down and buttoned. Tunic untucked. 4D – Navy blue undershirt tucked into pants. Tunic not worn. 4E – Navy blue undershirt tucked into pants. Tunic not worn. Rank slide worn on belt. 6 – Physical Training shirt, shorts and shoes worn. 7A – White or Grey overalls worn. 7B – Navy blue overalls worn. 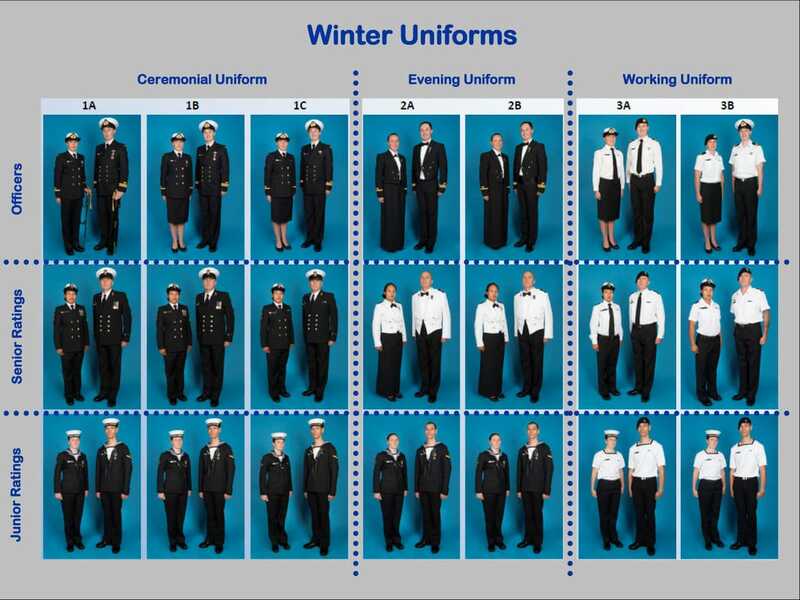 This informs you of which items of uniform you are required to wear with the corresponding number and letter. 1A, 1B, 1C – White cap with tally, trop shirt, SD jacket, collar, silk, lanyard, tape, name tag, bell-bottom trousers, belt, black socks, and SD shoes. 3A, 3B – White cap with tally, trop shirt, name tag, bell-bottom trousers, belt, black socks, and SD shoes. Jumper (with rank slides and name tag) may be worn. 4A, 4B, 4C – SCC or Unit baseball cap, navy blue undershirt, tunic, name tag, rank slides, trousers, black socks, and boots. 4D – SCC or Unit baseball cap, navy blue undershirt, trousers, black socks, and boots. 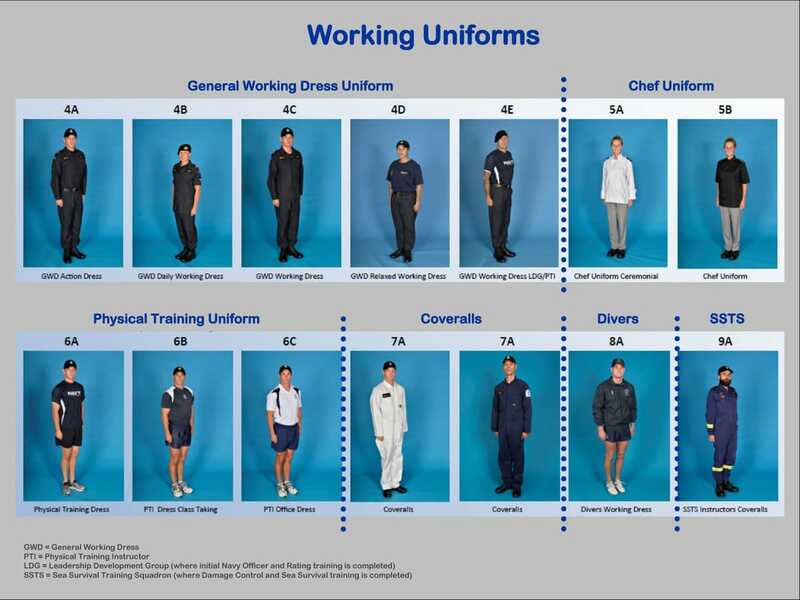 4E – SCC or Unit baseball cap, navy blue undershirt, rank slide, trousers, black socks, and boots. 6 – Unit baseball cap, physical training shirt, shorts, socks, and shoes. 7A, 7B – To be issued when required. Put on 3A/3B. Ensure name tag and badges are afixed correctly on the SD jacket. ​Your uniform requires special care to maintain it to a high standard. Uniforms are not to be altered in any way other than hemming to the correct length. SD Jacket and Trousers - should be dry cleaned. They may be spot cleaned with a clean, damp cloth or washed in cold water if you are unable to have them dry cleaned. Hang on the washing line to dry – DO NOT put them in the clothes dryer as they will shrink! Iron them inside out, on the Wool setting of your iron. Trousers are not to have centre creases – they are to be ironed flat and inside out so that when right-side-out the outside seam points inwards. These items iron up best if they are a bit damp – so do not dry completely before ironing, spray lightly with water before ironing or use a damp cloth between the iron and the fabric. Trouser hems are to be sewn with black cotton only. Jacket is to be ironed using your damp cloth – iron as much of it inside out as possible as this helps stop it going shiny. Sleeves are not to have a crease running down them. Tropical (trop) Shirt - must be washed after every use in hot or cold water. Stains can be removed by making a paste from Napisan and applying directly to the stained area, making sure to avoid the blue stripe around the neck of your shirt. DO NOT soak your trop shirt in Bleach. Iron your entire trop shirt inside out, but ignore where the creases will go. Whilst inside out, centre crease the sleeves so that when right-side-out the crease points inwards towards your arm. Iron the back inside out, with a centre crease so that when right-side-out it will point inwards towards your spine. Turn the trop shirt in the right way and iron the centre crease down the front – use a large handkerchief over the creased area so as not to transfer any mark from the iron onto the front of your shirt. Any item of clothing worn under your trop shirt must not show through or out at the top of the square neck. Silk - can be hand washed if necessary in cool water. It needs to be ironed, on low heat (SILK setting on your iron), before each wearing. Fold in four lengthways – two outside edges into the middle and ironed, then folded down the centre crease and ironed flat again. Lanyard - should be hand washed with a little hand or laundry soap, and then hung to dry in a warm place, like the hot water cupboard. If looked after it should only require washing once or twice a year. Blue Jean Collar - should be washed in cold water. Iron flat first on the back and front of the collar, avoiding the blue and white stripes – these tend to melt when ironed! Next, fold in half, blue sides together (so that the blue and white stripy side shows) and iron down the centre crease, then fold outmost edges back to the centre insides together. The completed collar will hang in an ‘M’ shape. Black Tape – can be hand washed if necessary in cool water. To iron: fold in half, with the two swallowtails (the two ends) in together. Next iron flat, the fold will create a crease in the centre of the tape. The swallowtails can be sealed with a little black or clear nail polish to prevent fraying. GWD’s – can be washed in either hot or cold water. GWD trousers DO NOT have centre creases. The GWD tunic does have creases down the sleeves. You must wear a plain (with no designs) navy blue, crew (round) necked, short sleeved t-shirt underneath your jacket. GWD’s may only be worn with black boots. The ankle tie of the trousers must be tied around the top of the boots. If you do not have boots and must wear your parade shoes. If you wear shoes you are to leave the ankle tie of the trousers un-tied. Seaman’s Jersey - should be carefully hand washed in cold water and dried somewhere flat. DO NOT put it in the clothes dryer as it will shrink. Hanging your jersey up to air out will often mean that you will not need to wash it as often. It can also be spot cleaned with a clean damp cloth. White Seaman’s Cap - must be cleaned with laundry soap and a brush, Jif, toothpaste or other abrasive cleaner – make sure that all cleaning product has been thoroughly rinsed off. Avoid getting cleaning product on your cap ribbon/cap tally. You may be able to gently slip your cap tally off your cap but under no circumstances untie the ribbon –this leaves the ribbon too short to retie properly and will result in you having to purchase another cap tally. Belt – Must be the one that you get issued with your uniform. It is black with a gold buckle and feeder end. By correctly stowing your belt after use you will avoid scratching your belt buckle too much. Roll your belt starting with the buckle end and stow on a shelf or in a drawer. You may wish to secure the rolled belt with a rubber band to stop it unrolling. DO NOT cut any length off your belt. Excess length can be threaded around the inside of your belt so that only the brass end shows next to the buckle. Shoes/Boots – are to be black leather lace ups with flat soles and black stitching. They are to be cleaned every time before wearing. Use black nugget shoe polish. Kiwi brand Parade Gloss is the best. DO NOT use liquid polish. Make sure your footwear is free of mud, dust and dirt before using a cloth or brush to apply the nugget in small circular motions, rubbing it into the leather paying special attention to the creases and toe area. Once the whole shoe/boot has been covered with a layer of nugget leave it aside while you apply nugget to the next shoe/boot. This allows the nugget to soak into the leather a little. Remove the excess nugget using a soft cloth or brush, rubbing across the shoe/boot. The leather will start to get a shine. You can help the shine along by breathing on your footwear to warm the polish, or by using a soft cloth or nylon pantyhose to give an extra shine. People will tell you about spit polishing or using a lighter to melt the polish, but these are rather extreme measures and are not more efficient than the above methods. Socks – Must be long or mid-calf length black socks only – no ankle socks. They must be washed after every wear. Usually you will need to line dry your socks as they will often shrink when put in the clothes dryer. Unit / SCC Baseball Cap – Wash or rinse in clean water after wearing it boating to get rid of the salt water. Salt will corrode the eyelets and clips if your cap has these. Otherwise, unless you wear hair gel, your cap should not require washing very often. DO NOT put it in the washing machine as this will ruin the peak. Wash by hand if required. Badges – are to be sewn on with same colour cotton, either by hand or machine. SCC insignia badges go at the top of your SD Jacket, right up by the shoulder seams, in the centre at the top of each sleeve. Black and gold rank badges and Good Service stripes go on the left sleeve of your SD jacket, three fingers below your insignia. It should sit half way between your shoulder and your elbow. Black and gold skill/specialisation badges go on the right sleeve of your SD jacket, three fingers below your insignia, again midway between your shoulder and your elbow. White and blue rank badges go on the left sleeve of your trop shirt two fingers up from the bottom of the sleeve, and centred on the crease. Buttons - must be sewn on securely using the correct colour cotton (the same colour as the button). It is ideal to shower or bathe before putting on your uniform. This helps keep the pieces of your uniform that do not require washing after every wear cleaner and means that they do not need to be washed so often. Your SD jacket and trousers (the black ones) and your jersey will start to get fluffy or shrink if they are washed too often. Make sure you wear clean uniform and use an anti-perspirant or deodorant.